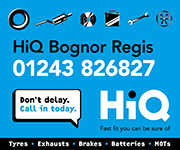 Testimonials for A&D Autos, MOT's, Servicing and repairs on cars, vans and motorhomes in Bognor Regis, West Sussex. Alex is always very helpful and over three years I cannot fault the quality of his work. Service and MOT carried out with a professional and friendly attitude. Would recommend this company. Fantastic service offered by Alex and his team. He kept us fully informed of the work required and delivered on time. I would thoroughly recommend the garage to all my friends and family. Fitted me in at short notice, gave a fair price and works completed on time. Thank you. They were able to fit me in at short notice before I went on holiday to replace the exhaust clamp. Car completed and returned - result a hassle free service and MOT. First class service, customer friendly. As a self employed Cabbie my cab is my living, Alex and his crew recognise this fact and bend over backwards to try and minimise downtime not just for me but for a number of other cabbies as well. A friendly, efficient service that I’d recommend to anybody. Alex and his team have got us out of deep hole twice this year. Once sorting out an issue caused by the main dealer! and once replacing our van's turbo - really quick and great value. A&D Autos are the first garage we have used without coming away feeling 'ripped-off'.